On the occasion of the World Wetlands Day promoted by the Ramsar Convention, LIFE Lugo + Biodinámico organized an informative day to make known among the students of CEIP Albeiros the actions of the project to recover these natural spaces. 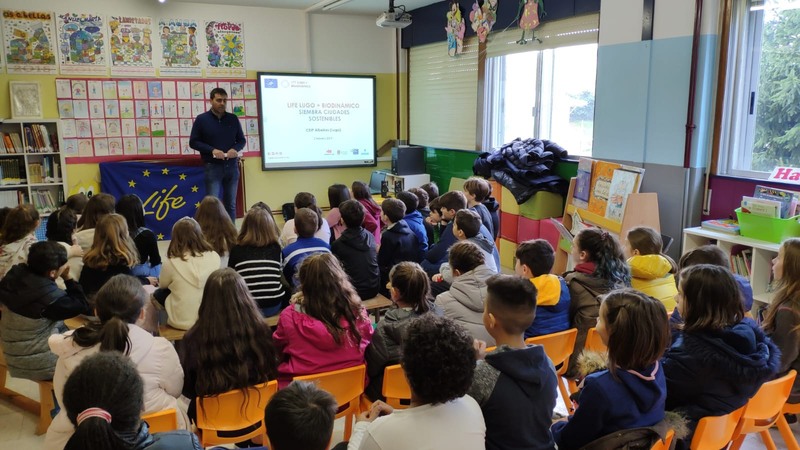 This meeting, which was attended by 50 5th grade children, is part of the Foro Verde activities of the project, which aims to make known among the citizens all the actions and benefits for Lugo that the LIFE project will have. During this visit, which was carried out by the Concelleiro de Desenvolvemento Sostible, Daniel Piñeiro and members of the USC, one of the entities collaborating with the project, special emphasis was placed on the recovery of the As Gándaras O Ceao wetland and its possible declaration as a Espacio Natural de Interés Local (ENIL) in the next days.